”Two Heroes without graves: Wallenberg and Delp” concluded Yoav Tenembaum. On September 15, 2007, coinciding with the celebration of Rosh Hashanah, the Berlin pastor Annemarie Werner participated on behalf of the International Raoul Wallenberg Foundation the ceremony which marked the 100th birthday of Alfred Delp, a German Jesuite priest who opposed the Nazis, saved Jews and paid for it with his own life -the sermon in the ”Vaterunser” evangelisher church- Berlin was dedicated to Alfred Delp. Delp was born on September 15th, 1907, to a Catholic mother and to a Protestan father. Despite his having being confirmed in the Lutheran Church, Delp decided to embrace the Catholic faith and became a Jesuite priest who served on the parishes of Munich. From within his church he actively and secretly helped Jews to flee to Switzerland through the Underground movement. 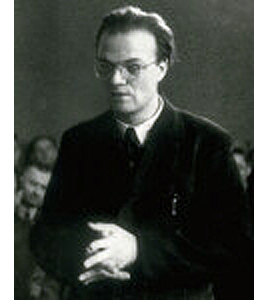 Together with his mentor, the Jesuite priest Augustin Rosch, Delp spread around the Jesuite philosophy against any form of totalitarism, and for this both of them were constantly harassed by the Nazi regime. Following the botched plot to kill Hitler on July 20th, 1944, Delp was arrested by the Gestapo who suspected his involvement with the conspirators. In his trial, the Nazis dropped those charges but nonetheless found him guilty of high treason and sentenced Delp to death by hanging. In the days ensuing the sentence, the Nazis offered him a deal. They were ready to pardon Delp and release him against his commitment to leave the Jesuites. Delp turned out the offer and was executed on February 2nd., 1945. The writer of these lines is a volunteer at the International Raoul Wallenberg Foundation, a non-governmental institution devoted to honor and divulge the heroic deeds of Raoul Wallenberg and other heroes, such as Alfred Delp, who shed light in the darkest of ages.